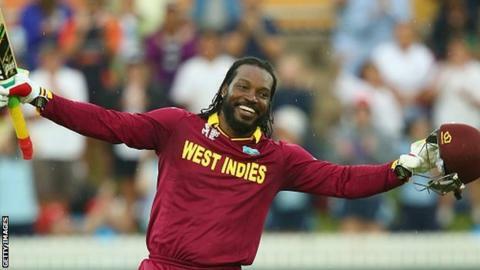 Somerset have signed West Indies opener Chris Gayle to play up to six matches during this summer's T20 Blast. He will arrive on either 22 or 29 May, depending on how far his Royal Challengers Bangalore franchise progress in the Indian Premier League. The big-hitting Jamaican, 35, has made 13 centuries in Twenty20 cricket. "Signing a world-class player of the quality of Chris Gayle is tremendously exciting for the club," said director of cricket Matthew Maynard. "He will be a tremendous addition to our already extremely strong squad. He is an inspirational character and we are delighted to be bringing him to Somerset." The left-hander is one of the most charismatic and entertaining players in world cricket, having played 103 Tests, 269 one-day internationals and 45 T20 matches for the West Indies since his debut in 1999. He also has previous experience of county cricket with Worcestershire. Gayle could make his Somerset debut in their home game against Sussex on 22 May, or against Essex at Chelmsford a week later. He will then be available for home matches against Kent (31 May), Hampshire (5 June) and Surrey (12 June) before finishing his brief stint with the county in their away game against Glamorgan on 13 June. Gayle is the third signing by Somerset for the T20 Blast, with Pakistan all-rounder Sohail Tanvir joining the club for the first half of the competition before being replaced by New Zealand's Corey Anderson. He hit the first hundred in a T20 international against South Africa in 2007 and his total of 6,975 runs in the game's shortest format is a record. Gayle is the only player to have a Test triple century, a 50-over double century and T20 hundred to his credit - and last month became the first man to score a double hundred in a World Cup game when he made 215 off 147 balls against Zimbabwe in Canberra. "Many of the club's members and supporters will know that I came close to playing for the county in 2012 and I have always felt that, if I was able to, I wanted to honour that commitment to Somerset," Gayle said.